Relatives: Son of George and Elizabeth Makin. Address: 59 George Street, Hadleigh, Suffolk. Frederick Makin was born in Hadleigh in 1894. He was the son of George and Elizabeth Makin and in 1901 the family lived at 9 New Cut, Hadleigh. Also living at home at that time was Frederick’s elder sisters; Bessie, Beatrice and Rose. 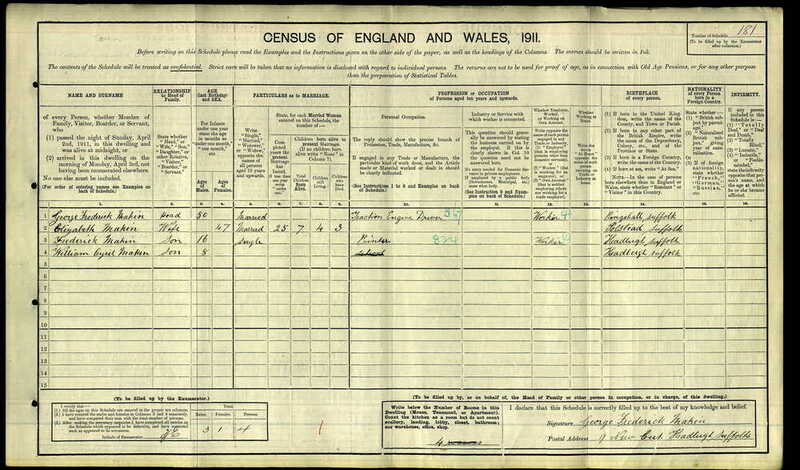 By the time of the 1911 census, the three young ladies had left home, leaving 16 year old Frederick and his younger brother, 8 year old William at home with their parents. Frederick was employed as a printer. Interestingly, his father George was a traction engine driver. We are not sure when Frederick enlisted into the Army, but it is likely that he was swept up with the wave of patriotism that broke at the outset of war and saw thousands of young men head off to the recruiting office. We know that Frederick joined the 8th Battalion The Buffs, East Kent Regiment that was established in Canterbury in September 1914. The 8 Bn The Buffs were part of the 72 Brigade of the 24 Division. The entire Division was established as part of Kitchener’s Third New Army (K3). As a Division it got off to a slow start. It was not until March 1915 that the first drab uniforms arrived and July 1915 when the first rifles were issued. 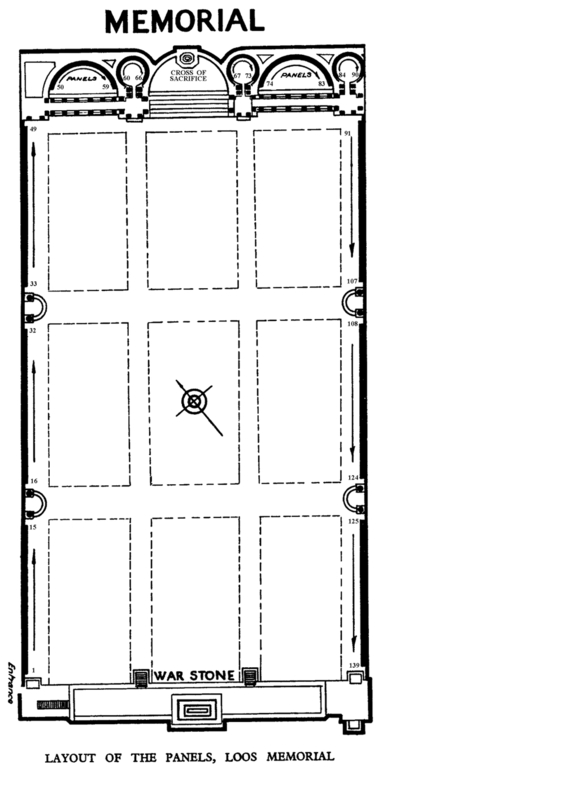 Private Makin's Medal Index Card. They were sent into action the following day, 26 September 1915. 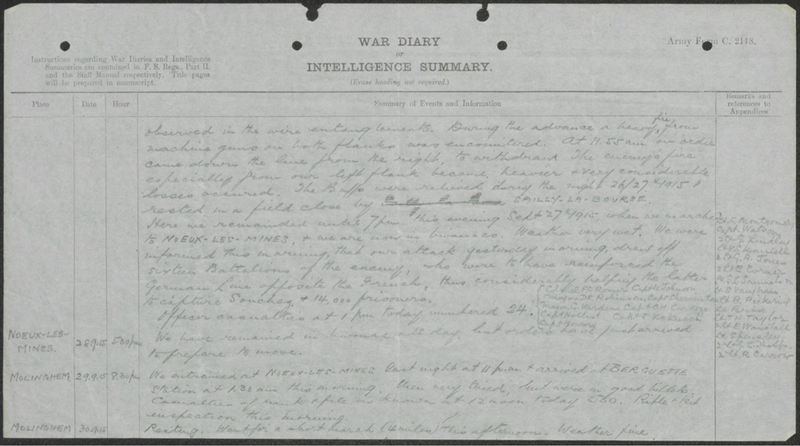 The battalion war diary gives a detailed account of the assault. At 11:00 on Sunday the 26 September the Buffs left their trenches in artillery formation. They immediately encountered long distant rifle fire which caused them to extend their lines. The advance was carried forward rapidly and by 11:30 the leading elements were within 25 yards of the German barbed wire. No gaps could be found and the Buffs started to receive incoming machine gun fire from their flanks. At 11:55 the order came down the line from the right to withdraw. During the withdrawal enemy machine gun fire from the left flank became heavier and caused considerable losses. The Buffs were relieved during the night and rested in a field nearby, where they remained until 19:00 on the 27th. They then marched back to Noeux-Les-Mines and into bivouacs. On the 29th they boarded a train to Berguette where they went into good billets. It was then that the extent of the losses were established. Casualties numbered, 24 Officers and 530 Soldiers. The Division moved to Aldershot for final training in June 1915 and by August they had made good progress and were inspected, first by Lord Kitchener and then by King George V. By the end of August they had received orders to move to France. By early September, concentration was complete in the area of Etaples, which is close to the coast and some 110 miles to the rear of the front line. After a series of lengthy forced route marches the Division was brought into the reserve for the British assault at Loos. This was to be the ‘Big Push’, the allies first large scale major offensive. The plan was to launch the offensive over a broad six-mile frontage in the French coal mining and industrial area extending from the La Bassee Canal, south to the town of Loos. The action began early on the 25th with the disastrous first use of gas by the British. GHQ planning had left the reserve Divisions too far back to offer any useful reinforcement on the first day of battle. 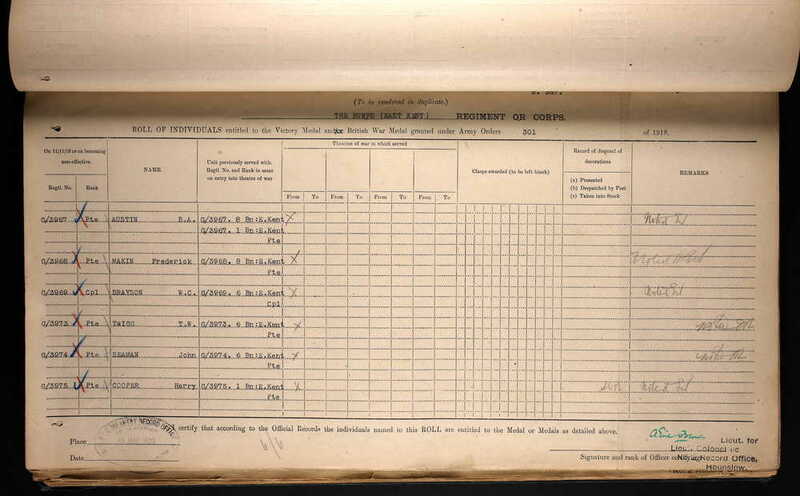 The battalion war diary, events of the 26th Sep were entered after the battle on the 27th. 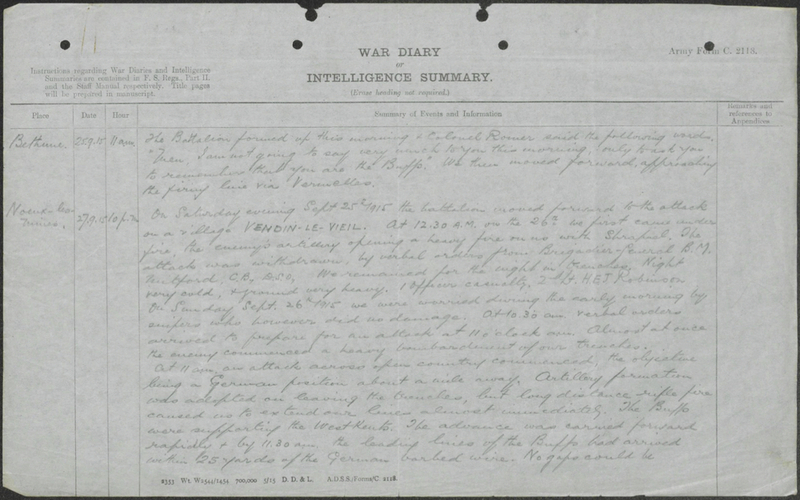 War diary noting the number of casualties. There was some slight consolation, the Buffs were told that their attack had drawn as many as 16 German battalions who were to reinforce the German line in front of the French troops. This considerably helped the French to take Souchez and capture 14,000 German prisoners. 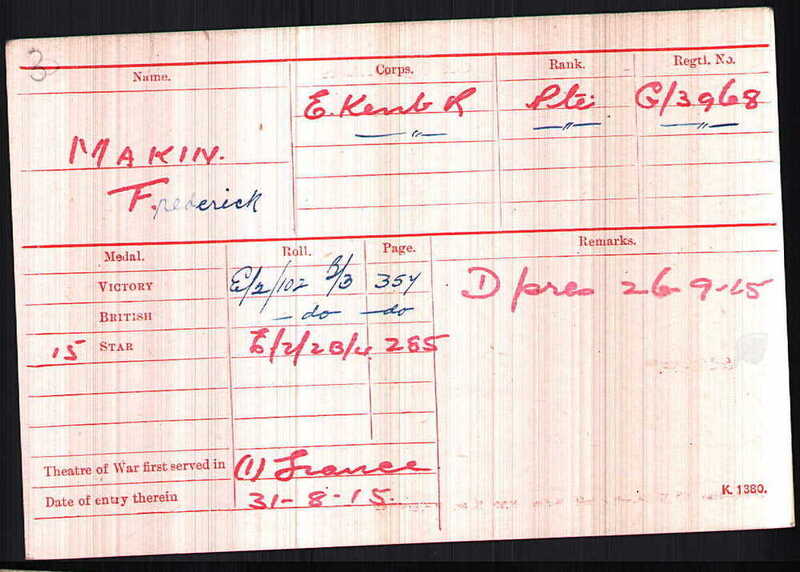 Sadly, many of the casualties were either killed or missing on the battlefield and that included Frederick Makin. He is commemorated on the magnificent Loos Memorial to the Missing which surrounds Dud Corner Cemetery. The cemetery stands on the site of a German strong point that was captured by the 15th (Scottish) Division on the first day of the battle. The name Dud Corner is believed to be due to the large number of unexploded enemy shells found in this area after the Armistice. The memorial commemorates over 20,000 officers and men who have no known grave. On either side of the cemetery is a 15 feet high wall, with fixed tablets on which the names of the missing are engraved. 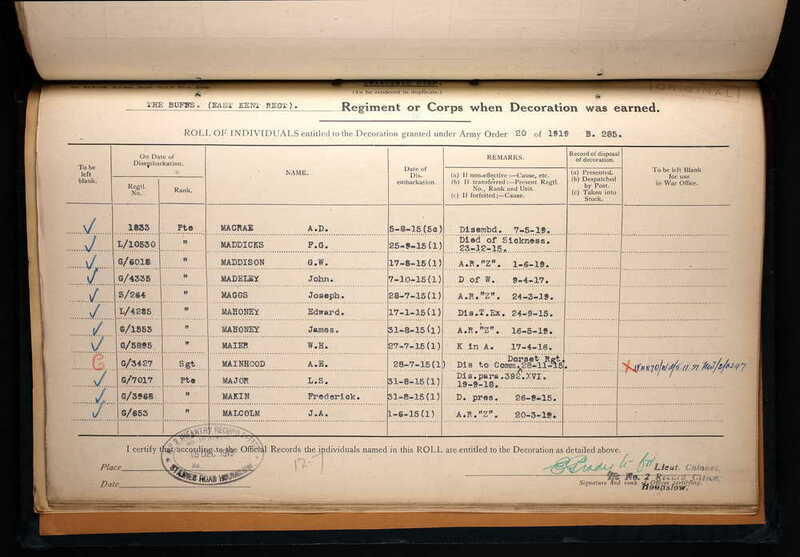 We hope that this page has been able to tell the story of Private Frederick Makin. If you know of any information which might help to add to the story then please get in touch.